The savvy grassroots organization, Common Ground, an affiliate of the national Industrial Areas Foundation, is taking on wealthy Wall Street hedge fund owners who want several hundred million dollars of tax money to help pay for a new arena for the NBA's Milwaukee Bucks, a franchise they recently purchased for $550 million. Common Ground, much to the dismay of Milwaukee's old guard downtown business leaders, has caught the attention of local and national media by fashioning a modern morality play, casting in sharp relief the choice between private greed and public need. I witnessed a scene from the evolving play in Milwaukee on Sunday. On Sunday afternoon, Common Ground toughened its stance. After being ignored by the Bucks' new owners who months ago promised to meet with them, the Common Ground delegates voted to fight against any public funding for a new arena. In Milwaukee, elected officials have been reticent about opposing the use of public funds for a new basketball arena. Nobody wants to be accused of losing the Bucks if it comes to that. Neither do most elected officials want to be on the wrong side of the wealthy leaders of the Milwaukee Metropolitan Milwaukee Association of Commerce. So almost single-handedly, the tenacious Common Ground organization is changing the local conversation by forcing the community to consider that maybe its values and priorities are not the same as the values of a couple of Wall Street hedge fund owners and their local counterparts. Common Ground's leaders know what they're up against, but they're hopeful realists. One might say they're practicing the audacity of hope. Then there’s another proposal. Southeastern Wisconsin Common Ground — a splendid coalition of churches, community groups, mosques and synagogues — stifled the temptation to shout “No!” to the prospect of funneling precious tax dollars to billionaire owners and millionaire players and coaches. When Common Ground released its proposal last month — based on a careful study of recreation centers and fields in the city and surrounding suburbs — the owners told the press they would happily talk with the group. That has not happened. Common Ground members spoke of receiving heated phone calls from Ted Kellner, a prominent business leader and minority owner in the Bucks, wondering why they were complaining. In the schools, a woman spoke of having her contract dropped after officials complained she was working with Common Ground. The meeting involved several community groups—Durham CAN, Durham Community Land Trusteesand the Coalition for Affordable Housing and Transit—plus the city planning department the Triangle Transit Authority, which is spearheading the 17-mile, $1.8 billion project. Gun-trace data is essential to unlock the DNA of the epidemic of illegal guns in our cities. There is no better way to stop the illicit trafficking in weapons than to make those who manufacture, buy and sell weapons more accountable and those transactions more transparent. How? Make it easier to trace guns, via technology (serial numbers that can't be erased, for example) and federal laws mandating that gun-trace data be shared with local jurisdictions and, where it won't compromise an ongoing criminal investigation, with the public. Was a weapon recovered at the crime scene? What type of weapon? Was a gun trace initiated? Did the trace lead to a source – a gun show, a pawnshop, a federally licensed dealer – or did it dead-end in a home burglary or an off-the-books transaction? Now the gun world sees him a different way: as a traitor. The target of their fury is the smart gun Mauch designed at Armatix, a start-up near Munich. The very concept of the weapon has been attacked by U.S. gun rights advocates even as it has helped Mauch resolve a sense of guilt that has haunted him his entire career. The Metro Industrial Areas Foundation, a group pushing manufacturers for better gun safety, recently met with Mauch in Germany and hope to bring him to the United States to persuade police chiefs to buy his company’s guns. The idea: If the technology is good enough for police officers, it should be good enough for consumers. Armatix is developing a 9mm smart gun targeted at the law enforcement market. The company hopes to offer other controls besides a watch, including a version that responds to voices. Community groups are beginning to spread the word about the mold and moisture settlement. Monique George, the NYC organizing director for Community Voices Heard, a group with a long history of working in public housing, says CVH has done “mold surveys” at five buildings in two public housing developments, and plans to conduct hundreds more. “We’ve been door knocking,” George says. “Step two will be to actually document the cases.” Manhattan Together, South Bronx Churches, along with Metro IAF’s East Brooklyn Congregations, plan to engage thousands of public housing residents across the city on this issue. Some southeast Queens residents, especially around St. Albans, Laurelton and Springfield Gardens, get the chills every time thunderstorms are looming. Heavy rain, to them, basically means flooding in their homes, lawns and streets. E. Thomas Oliver, a Laurelton resident for more than 40 years, basically had to pump water out of his basement “24 hours a day, seven days a week.” Rain was bad news. To tackle this chronic problem, the city Department of Environmental Protection started work a few years ago to upgrade the sewer system, a targeted solution designed with the collaboration of Empowered Queens United in Action and Leadership. In his case, the floods are finally gone, but not before DEP cleaned catch basins filled with debris. Now the city agency has begun working on a project to install storm sewers and catch basins at 119th Avenue between 192nd and 195th streets in St. Albans. According to DEP, the infrastructure will cost $1 million and should be completed by this fall. “We are pleased to collaborate with EQUAL on these important projects that will bring new storm sewers to reduce chronic flooding,” DEP Commissioner Emily Lloyd. David slew Goliath. They became allies. And now Goliath is helping David build affordable single-family homes.That's the short version of how a community group came to begin building the Jackson Green Homes – 22 single-family homes across the street from the Hub shopping center on Martin Luther King Drive – with the help of a multinational conglomerate. Last week, supporters of a grass-roots effort to require kindergarten in New York rallied at St. Gabriel's Catholic Church in New Rochelle to call on the state legislators to support a bill that would do just that. The group, Westchester United, drew nearly 300 people to the church to thank state Sen. Jeff Klein for his support for Assembly bill 5786 and Senate bill S5056 and to ask other legislators to follow suit. In speaking to the crowd, the Rev Bruce Baker of All Soul's Parish in Port Chester, said, "We're asking Speaker (Sheldon) Silver and Governor (Andrew) Cuomo to do the same thing that over 40 states, New York City, Buffalo, Syracuse, Rochester, and Utica have done: Guarantee Access to Kindergarten!" Heriberto Contreras, of St Gabriel's Church, added, "With Senate Majority Leader Klein's full endorsement, we've made real progress in a world that's designed to obstruct and stop ordinary people like us from accomplishing anything." Hannah Senft, Candy Savannah and Ron Taylor have been neighbors for more than 20 years in Georgetown South, a community of 800 townhomes in Manassas, Virginia. It’s a diverse, working-class suburban neighborhood about 30 miles from the White House. Many communities suffered in the housing crisis and, for residents of Georgetown South, there’s no end in sight. Not only did J.P. Morgan Chase and other predatory lenders flood the market with subprime loans that were structured to fail, they turned Georgetown South into a place where absentee landlords allow their properties to fall into squalor as the neighborhood struggles to rebuild. Hannah and Candy, together with the Georgetown South Homeowners Association, led by Meg Carroll, a former police officer, and VOICE, a broad-based citizens’ organization, are fighting absentee investors to clean up their yards, exterminate the rats, fix housing code violations and stop abusing immigrant tenants. VOICE has already secured $30 million in commitments from Bank of America, General Electric and the Virginia Housing Development Authority to rehabilitate blighted properties and develop new housing in neighborhoods like Georgetown South. To date, J.P. Morgan Chase has refused to participate. Used properly, the DOJ settlements create a powerful opportunity to help rebuild devastated communities like Georgetown South and others nationwide and to find justice for the millions of Ron’s still struggling. The question is: Will President Obama and Attorney General Holder compel bankers to really clean up their mess? Leaders of the Greater Boston Interfaith Organization hope to bring more attention to a tentative pact that would allow Partners to complete a takeover of South Shore Hospital in Weymouth, while placing limits on how much the state’s largest health care provider can charge for services and restricting its expansion for five to 10 years. “This agreement has potentially very significant implications for efforts to control health costs,” the interfaith organization’s president, the Rev. Burns Stanfield, pastor of Fourth Presbyterian Church in South Boston, wrote in a letter to the Health Policy Commission. The interfaith group waded into the debate over medical care prices last September when it invited leaders of the area’s largest hospitals and health insurers to a meeting at Temple Israel in Boston’s Longwood Medical Area — and grilled them on what they could do to blunt the impact of soaring health costs. The rally was sponsored by the Washington Interfaith Network, a congregation-based community organizing group. Members of the organization said they had been visiting residents at the shelter in the past six weeks, and have been stunned by their stories. WIN is the latest group calling for policy changes at the shelter, including adding on-site counselors and a playground. City officials were stunned this winter by a 135 percent increase in the number of homeless families seeking shelter during hypothermia season, when the District is legally obligated to house the homeless. In an unusually cold winter, about 550 children were packed into the old hospital. The overcrowding reflects a dire lack of affordable housing in the city. Out of shelter space, the city began placing families in recreation centers and motels in the District and the Maryland suburbs. The city leaders eventually ended the practice of placing families in other jurisdictions and a judge declared the practice of using recreation centers unsafe and illegal. Pastor Patrick Smith of St. Augustine Roman Catholic Church in Northwest told the crowd it was time to add pressure to fix conditions there. He told representatives from the churches to think of residents as neighbors. MILFORD >> Gov. Dannel P. Malloy, New Haven Mayor Toni Harp, Bridgeport’s police chief and other leaders gathered at St. Gabriel’s School Monday to pledge their support of the national “Don’t Stand Idly By” anti-gun violence campaign that calls upon change to begin with gun manufacturers. Malloy, who received huge applause from the crowd, announced he is joining a bipartisan list of leaders who have signed on to a Request for Information to the gun industry about basic information regarding distribution practices so that guns don’t get into the wrong hands, and about technologies to improve gun safety. Malloy said he’d like to see all guns come with gun locks and also “smart guns” that recognize their owner, but working with manufacturers in this way is a movement in its infancy. According to information distributed by CONECT via the “Do not Stand Idly By” campaign, taxpayers and the public sector have significant power in the firearms marketplace because only 40 percent of firearms are purchased by the military and law enforcement, including police. CLEVELAND -- Their rallying phrase: Our united power builds a Greater Cleveland. It's strength in numbers. It's getting loud enough to get something done. The Greater Cleveland Congregations pulls people from more than 30 faith groups to make change from the ground up with one new goal: stopping illegal guns. There've been more than 40 shooting deaths already this year across Cuyahoga County. GCC is suggesting a county-wide initiative that pull federal, county and city leaders together to squeeze the pipeline of illegal guns and hold people accountable. GCC also addressed what they call Cuyahoga County's "felon factory" Thursday. They urged prosecutors to save prison time for violent criminals and seek misdeameanor charges and other methods, like rehabilitation for drug crimes. Cuyahoga County Prosecutor Timothy McGinty spoke in response to these requests, saying the focus of his office will be "serious offenders," and the office has tripled the number of drug cases it sends to diversion programs. He said those changes could help filter down to create a stronger and more attractive region. "When we have better justice, this will be a better place to raise our families and the exodus will end," said McGinty. Let’s revamp this notion of gun control. Let’s make America a safer place by making it much more difficult for criminals to get guns – not the law abiding. You’re absolutely right. But we must do a far better job of enforcing it. And gun manufacturers, both domestic and international, must play a more active role in helping to police their products. Keeping guns out of the hands of killers and opportunistic street criminals. Andrew M. Cuomo arrived at The New York Times in an expansive mood on Wednesday. Reporters being reporters, they barraged him with the usual, “Hey, you going to let New York’s new mayor tax the wealthy in pursuit of prekindergarten” questions. Just one detail: The mayor will not accomplish this with a tax increase on the wealthy. Oh, and you know, the governor confided: “Nobody has a good estimate on what it is going to cost. The mayor appointed a commission to figure it out.” He smiled. I got Michael Gecan on the telephone. A few years back, he and others fromWestchester United, a citizens’ group, pushed the governor to make good on 45,000 promised jobs from the Tappan Zee Bridge’s rebuilding. For months, they couldn’t get a straight answer. Then a spokesman for the governor clarified that the governor was talking about 45,000 job years, which could mean 5,000 people working nine years. Or something like that. On the one-year anniversary of Newtown, and approaching the fifteenth year after my father was murdered with a handgun in Chicago, I felt something I hadn’t felt for a long time regarding gun violence in America: optimism. Working with the Metro Industrial Areas Foundation citizens’ organizing network, clergy in ten states have been approaching mayors, police chiefs, governors (and President Obama, who hasn’t responded) to ask that they pay more attention to the practices and capabilities of the companies they buy guns from. On Sunday, January 5th, NBC Dateline aired an important story on Metro IAF's work to pressure the New York City Housing Authority to clean up the mold and moisture that causes asthma. This work led to a legal settlement with NYCHA and the CITY in December. 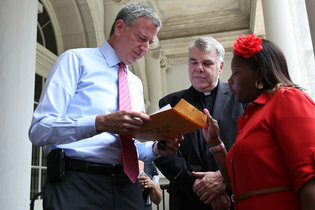 This year, he and other clergy from New Jersey started the "Do Not Stand Idly By" initiative to reduce gun violence. A key demand is to get gunmakers to accept responsibility, and act accordingly. The top manufacturers fueling US gun culture are all European. Mosbacher and other local clergy have therefore decided to raise awareness and confront the manufacturers in Europe. DW talked to Rabbi Mosbacher about his visit.